July 30, 2011 | Posted by Kate B. Flooding in Pakistan and bad weather in India has majorly impacted the production of cotton in those countries, and, by extension, has caused rising prices on cotton-heavy items here in the United States. The recession has not helped, but when major cotton producers such as Pakistan and India have trouble supplying manufacturers with the raw materials they need to produce apparel and bedding, it leads to rising prices and declining quality on those items around the world. In an article posted on November 3, 2010, New York Times staff writer Stephanie Clifford explains that manufacturers which produce jeans and other articles of clothing made primarily from cotton are scrambling to cut corners while maintaining quality. Liz Claiborne, which makes brands like Juicy Couture and Kate Spade, has had to pull back from importing Italian fabrics and, instead, is dealing with suppliers who make their own raw materials or yarns. Buttons and trim are also on the table for review at Liz Claiborne: can smaller buttons and less expensive trim be used on apparel and still catch the eye of consumers? And then there are companies like Lululemon Athletica, the sportswear company, which has moved some of its manufacturing from China to Viet Nam, Cambodia, and Bangladesh, where wages are lower. Bon Tons retail prices rose 5-8% in 2010, and they are now selling sweaters knitted with rayons, acrylics, and other synthetic fibers in order to avoid raising prices in the stores. Levis, Hanes, Playtex…the list of retailers feeling the cotton pinch is a lengthy one. They are responding by moving away from natural fabrics and towards synthetic fibers and blends. Naturally, Cozytown Linens does not want to start selling acrylic bedding! The thought of our customers sleeping on uncomfortable sheets made from acrylics is something we don’t ever want to consider. But we also don’t want you to have to take out a second mortgage on the house in order to sleep on fine, soft, cool cotton sheets and pillow cases! But there’s hope: some farmers in the United States have decided to grow cotton–not only farmers in the southwest, but also in Texas, Mississippi, Alabama and Georgia. This can only help the price of cotton in the United States, and help us keep our prices down. At Cozytown, quality means everything. We want you to rest your head on the most luxurious pillows every night of the year. We want you to slip under silky cotton sheets in the summer, and buttery-soft flannel sheets and toasty warm, fluffy down blankets on cool autumn nights. In short, we’re here to help you get the most out of those all too brief eight hours every night! At Cozytown Linens we have the privilege of talking with so many wonderful people from all across the country. Through our conversations, we discover what their needs and interests are, which many times is a reflection of main stream America. It allows us to focus our product line on the newest trends, sizes, and items people are looking for so that we can better serve our customers and possibly reach new ones. Here are a few of the most commonly asked questions we receive. We welcome all comments and questions, so if you don’t see the answer you are looking for, please contact us. We will be happy to answer any questions you may have. How do I measure my bed? It is important to know the exact measurements of your mattress before purchasing bed sheets. Even though you may know what size bed you have (twin, full, queen, or king) don’t take it for granted that it is a standard size. Many bed manufacturers do not make their beds to the standard size and as a result dimensions can vary up to two inches in both the width and length. To measure the width: Place a tape measure at one of the top corners and extent it to the opposite top corner. To measure the length: Place the tape measure at one of the top corners and extent it to bottom corner on the same side. Do not measure diagonally. To measure the depth: If the side of the mattress has a cording, do not measure from cording to cording. 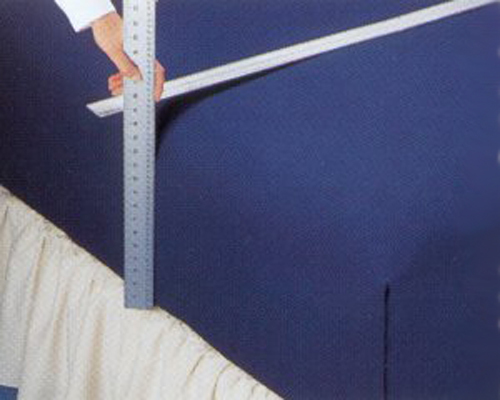 The most accurate way to measure the depth or thickness or your mattress is to take a yard stick or ruler and lay it across the top of the mattress allowing it to extend over the edge of the mattress. Measure from the top of the ruler to the top of the box spring, or if you have a platform bed, measure from the top of the ruler to the bottom of the mattress. (See the image to the right.) The distance between these two points is the ‘depth’ or ‘thickness’ of the mattress. What does ‘pocket depth’ mean? Nearly all fitted sheets have vertical seams at each corner. 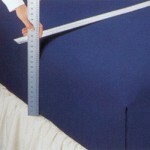 The pocket depth is the measurement of the vertical seam at the corner of the fitted sheet. What size pocket depth fitted sheet do I need for my bed? This is a very common question and a very important one as well. For a proper fit, the pocket depth of the fitted sheet should be one or two inches deeper than the depth of the mattress. This will allow a little extra for tucking under the mattress, yet not so much that it causes wrinkling and bunching in the sleep surface. For example, if the mattress measures 8” deep, a fitted pocket depth of 9” or 10” should work fine and give a taut fit. What is the difference between Conventional Bed Sheets and Adjustable Bed Sheets? Simply put, a conventional or traditional bed is any ‘non-adjustable’ bed. An adjustable bed is one that has a motorized base that allows the foot and head to be elevated, such as those used in a hospital. Can I buy just a fitted sheet and not a complete sheet set? Yes. Cozytown Linens offers separate fitted sheets so that you don’t have to purchase a complete sheet set. For your convenience, the following links will take you to the section of our website where you will find fitted sheets as separates for both the conventional and adjustable beds. Why are your sheets more costly than those sold in department stores? Our sheets are more costly than those sold in department stores and there are a few reasons for that. I can assure you it is not because we are making a huge profit. 1) At Cozytown Linens we have always been committed to keeping our prices as low as possible. After realizing the dilemma people were facing of only being able to find deep pocket fitted sheets in department stores that did not work well for shallow mattresses, we decided to try and solve this problem. We began offering fitted sheets in several bed sizes with pocket depths starting at 6” and available in one inch increments up to 25” deep. Basically, what we do is offer custom sizes at non-custom pricing with a non-custom policy. All of our bed sheets are made to order; we do not stock anything. In order for us to offer this type of service, there are costs involved. 2) All of our sheets are made right here in the USA, and although many of us would prefer American made linens, American workers are paid more than foreign workers, which reflects in the cost of the product. 3) Many are surprised to know that there is currently a world-wide cotton shortage. This has drastically affected the pricing of soft goods because the more costly the cotton, the more costly the fabric, hence the more costly the finished product will be. Are all of your sheets made in the USA? Yes, and we are very proud and happy to be able to offer American-made bed sheets. We are committed to supporting our country and our American workers. Adjustable beds, once thought of as a novelty, are becoming quite popular, especially among the baby-boomer generation. These beds boast many advantages, both medical and practical, that have helped fuel their popularity. Many of those who purchase adjustable beds list health reasons as the factor that influenced their decision. Still others enjoy the convenience of being able to read or watch television in bed while remaining comfortable. The most popular sizes are the split adjustable beds, which are two beds placed side by side and adjust independently: Split Queen (two 30 x 80 beds), Split King (two 39 x 80 beds) and Dual California King (two 36 x 84 beds). These sizes are perfect for couples since they allow each person to set the bed at the angle that suits him or her without disturbing their partner. Adjustable beds require sheets that are specially designed to ensure that the fitted sheet will not pop off the corner of the mattress when the head and/or foot of the bed are raised. If you are considering purchasing an adjustable bed, it is important to know where to buy sheets, so that you can begin using your new bed as soon as it is delivered. For the best fit, purchase your bedding from a company that specializes in adjustable bed sheets. Properly fitting sheets will not only ensure a more comfortable night’s sleep, but will save you time and money in the future from having to replace ill fitting sheets. Save money and buy the size that fits right the first time. 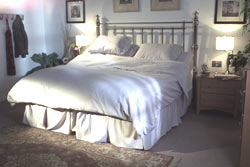 Cozytown Linens is proud to offer adjustable bed sheets. With nearly twelve years of experience, we have provided thousands of customers with perfectly fitting sheets. And best of all, they are made in the USA! With two styles to choose from: Conventional and Adjustable Bed Sheets with Wings, as well as several fabrics and colors, you will be sure to find perfectly fitting, luxurious sheets to match your lifestyle and décor.